During the Second Intifada, Israel announced the construction of a barrier to separate Israel from the West Bank. Construction began in 2003, and as of 2017 it is nearly 65 percent complete. In rural areas, the barrier consists of a state-of-the-art electronic fence. An imposing concrete wall 30 feet high–over twice the height of the Berlin Wall–runs through urban areas. Israelis typically refer to the barrier as the Security Fence and attribute the decline in suicide bombings within Israel to its construction. Palestinians frequently refer to the barrier as the Apartheid Wall. They deny that the decline in suicide bombings has anything to do will the construction of the barrier and argue that its true purpose is to create a segregated society where Palestinians remain under Israeli occupation. The route of the barrier suggests much about its purpose. Only 15 percent follows the 1949 Green Line. The remainder cuts into the West Bank. 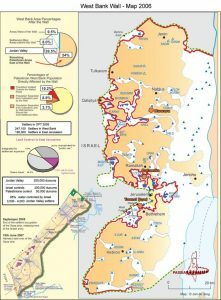 In its deviations from the Green Line, the Separation Barrier incorporates 440,000 of the almost 600,000 Israeli settlers into a contiguous block of territory with pre-1967 Israel. In addition to the more than 325,000 Palestinians of East Jerusalem who are separated by the barrier from the West Bank, 32 additional Palestinian villages fall between the 1948 Green Line and the Separation Barrier. Because its route does not exactly follow the ceasefire line, the international community has deemed its construction a violation of international law (see 2004 UN General Assembly non-binding resolution). 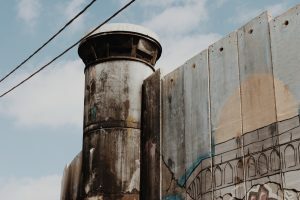 Churches for Middle East Peace (CMEP) opposes routing the security barrier through Palestinian lands and the limitations imposed on freedom of movement and economic activity by its construction (see Policy Position 3). The fertile Cremisan Valley lies between the Palestinian village of Beit Jala and the Israeli settlement of Har Gilo near Bethlehem. Since 2006, the Israel Defense Forces (IDF) have been planning on extending the Separation Barrier across the valley. If completed, this barrier would cut off 58 Palestinian families in Beit Jala from 850 acres of farmland in the valley, as well as preventing the children of Beit Jala from attending school at the nearby Catholic monastery and convent. While the Israeli High Court overruled the IDF’s building plans in April 2015, they reversed their decision later that year in August, allowing construction to go ahead.